'MLM' The American Dream Made Nightmare: Will banksters now be subject to the rule of law? Sadly, the ongoing, world economic crisis has produced countless millions of potential victims for 'MLM income opportunity' racketeers to ensnare. The quantifiable evidence proves that anyone claiming to be a 'successful MLM Independent Business Owner' is, in fact, a dangerous liar suffering from a self-perpetuating and self-gratifying delusion. Most readers of this Blog will be aware that the ongoing, world economic crisis was triggered in 2008 by the senior corporate officers, and employees, of various, US-based, major financial institutions. Whilst the regulators looked the other way, for several years, American 'banksters' had been artificially-inflating their projected 'profits' (and commission-linked bonus-payments) by unlawfully-lending vast quantities of cash (at inflated rates of interest) to an army of would-be, but poor, American home-buyers. Unfortunately, no matter what was stated on their mortgage applications, these doomed-borrowers had no real means of paying back their loans, because they were obtained through lies. 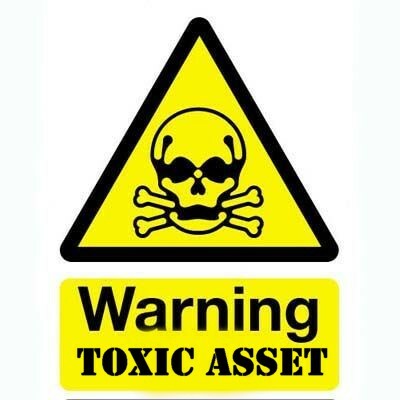 The resulting mountain of toxic-debt was then unlawfully packaged, and peddled, as a 'Triple "A" secure investment,' whilst the beneficiaries of this titanic racket unlawfully took out insurance to cover themselves when the twin, artificially-inflated markets for American real-estate, and for their effectively-valueless pieces of paper, inevitably sank. Fearing total financial melt-down, governments and regulators around the world apparently took the short-sighted decision not to try to re-establish the rule of law. Instead, virtually no major individual beneficiary of the 'liar-loans/toxic debt' racket has been held fully to account, whilst another mountain of paper money has been printed, and borrowed, by governments, to be pumped back into the demonstrably-corrupt, and failing, international banking system; theoretically, making future generations of tax-payers ultimately responsible. Thus, when given the choice between dishonour and economic depression, the 2009 crop of intellectually, morally and financially bankrupt world leaders chose dishonour, but (so far) we've got economic depression. As if to prove the validity of the above statement, it has recently been reported that Barclays Bank has been fined a staggering $450 millions by regulators in the UK and USA. However, if you dig a bit deeper into this frighteningly-familiar story, you discover that agents of the UK Financial Services Authority, the European Commission, the Japanese Financial Services Authority, the US Commodity Futures Trading Commission, the US Securities and Exchange Commission, the US Dept. of Justice and the Federal Bureau of Investigations, have all been conducting inquiries into the widespread fraudulent activities at least 20 banks during the period 2005-2009. 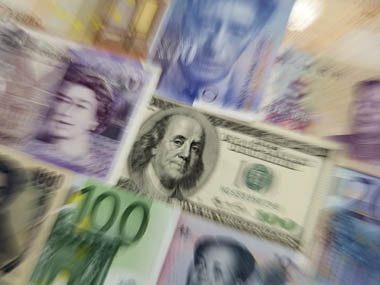 Although it would seem to be too absurd to be true, a few, relatively low-level, traders were placed in a position of power where they could manipulate key inter-bank interest rates which directly affected financial contracts worth trillions of dollars around the world; again in order to inflate-artificially their banks projected 'profits;' at the same time making more money (via commission-linked bonus payments) for themselves and for their bosses. In reality, Barclays is merely the first, major financial institution to be held to account for rigging key, inter-bank interest rates. Barclays now accepts that a group of its traders (no more than 20) systematically lied about how much it was costing to borrow money. So far the bank has been fined $92.5 millions by the UK FSA, $200 millions and by the US CFTC. Barclays' senior corporate officers have also agreed to pay the US Dept. of Justice a further fine of $160 millions as a 'settlement.' However, it is unclear why it has taken all this time for the regulators to take action. 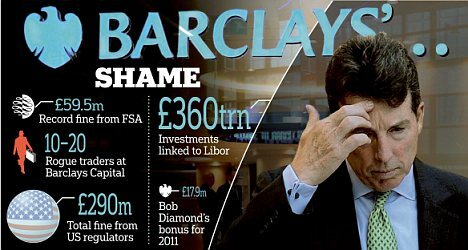 Amid widespread calls for their resignations and indictment for fraud, the American CEO of Barclays, Robert Edward Diamond (b. 1951), along with three other senior corporate officers, have limply-offered to give up their 'bonus,' but only for 2012. They have all insisted that they were completely unaware of any wrongdoing, but few people believe them. The day following the announcement of the fines, the market value of shares in Barclay's Bank fell by around 15.5 %, representing more than $5 billions. Perhaps the most-revealing aspect of these shameful events, is that the arrogant little gang of Barclays' traders whom the arrogant Bob Diamond steadfastly pretends were wholly responsible, did not seek to hide what they were doing from their colleagues. They openly discussed their racket in numerous text messages and e-mails. These electronic documents prove beyond all reasonable doubt that, because they do not fear being held to account, banksters still live in a potentially-catastrophic, fantasy world where lying in order to make money, is considered to be perfectly acceptable behaviour.